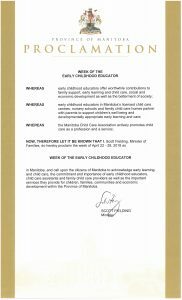 The Week of the Early Childhood Educator was established by MCCA in 1992, following the release of the national Caring for a Living Study. The celebration is intended to recognize the valuable work of those who “care for a living” by providing early childhood education, family support, and a service that contributes to the social and economic development of our province. It has been proclaimed annually by the Minister of Family Services, Government of Manitoba. Whether you work in an early learning and child care centre or a family child care home the Week of the ECE is a celebration of the important work we do with children and their families.